Today about 3 p.m., I was sulking in a cab on Broadway and 82nd St. I’d just come back from a painful physical therapy session, and, because my progress apparently isn’t going to be a perfect model of recovery, with each day improving upon the previous, I was so depressed, I limped on crutches into the nearest McDonald’s. (I know I promised Melissa over at glutenfreeforgood that I was giving up my junk food vice, but those Angus burgers are a hard habit to break.) I paid for my lunch and sat down between a shrieking brat of two, who sounded not unlike a howler monkey, and a drunken man of indeterminate age. When I opened my bag to fish out my meal, I saw something that has been ticking me off for some time, and I couldn’t deny it any longer: McDonald’s has been stinting on their french fries for months. The medium value meals have become less valuable as they contain about one-third fewer fries than when they were introduced, while at the same time their prices have only skyrocketed. Oh, I know they look fabulous, those fries, glowing bright and seductive under the heat lamps. They must hire professional fry fluffers because the shiny red containers are robust and voluptuous before going in the bag. But after the jostling and shoulder checking needed to make my way to the table, the fries settle into nothing more than a generous regular portion. At first, months ago, I thought it was me–after all, with increasing age comes increasing appetite–but The One, who has remained the same size these past 14 years, also commented recently. I ate the measly portion begrudgingly, too scared to go up and demand my full share, lest someone think I was raised badly and never read Tiffany Table Manners for Teenagers. It wasn’t the shorting me on my fries that got me, it was what else they did–sneakily, perhaps even perpetratively–that sealed the boycott. I slipped into Starbucks down the street to get a cup of coffee and wait for Andy, the guy who cuts my hair, to finish up next door with his client. As I handed a five-dollar bill (actual specimen above) to the cashier, she looked down at it then, suspiciously, at me. She called over the other cashier, and they turned their backs and hunched over the bill, whispering, nodding to each other. The barista, who was curious, joined them. She, too, nodded. “I’m sorry,” my cashier said pleasantly, “we can’t take this. It’s counterfeit.” The back of my neck prickled with shame. Did they think I printed up the fake bill in some filthy basement press? Was the line of customers behind me wondering if I was trying to put one over on JoJo and Co.? “Who prints fake fives?” the guy behind me asked. “Yeah, right,” I snorted, trying to sound casual, not guilty. “Maybe someone who’s trying to fly under the radar,” replied the cashier. “Don’t look at me,” I said. “I got that thing when I went to McDonald’s.” There was a palpable exhaling of air. A release. The fact that it was McDonald’s seemed to make sense to everyone–as if Mickey D’s not only makes money by clogging arteries and making kids fat but by printing and pawning off fake money. As I sat at the counter sipping my coffee, I felt the bill as the cashier did. It was indeed smooth and contained no red threads. Lincoln looked pallid compared to the crispy real fiver I had in my other hand. I vowed there and then never to return to McDonald’s (and I encourage our millions of readers to do the same) until 1) I get an apology from someone very high up in the organization. 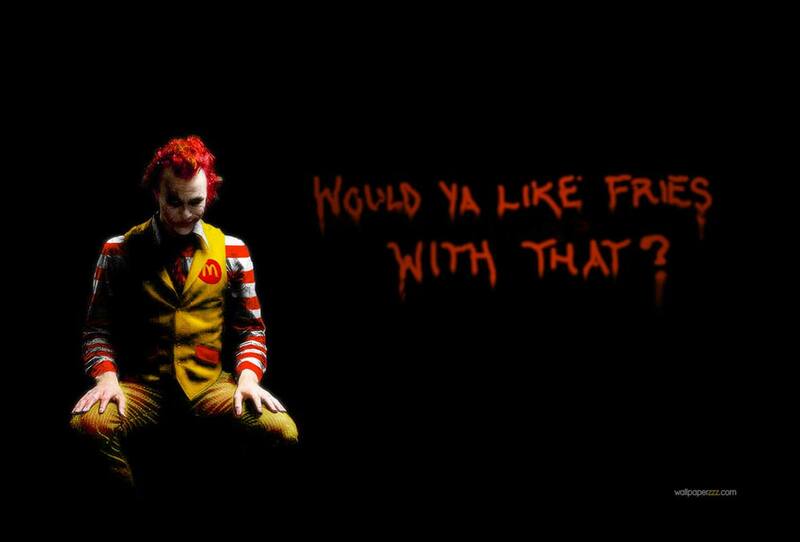 In a pinch, Ronald will do. And 2) I get a five-dollar gift certificate to replace my loss. Do you hear that McDonald’s Corporation? I won’t take this lying down–not even with a bum leg. Afterwards, I got my haircut, and as I fished in my wallet for a tip, I saw the bill. Do I pawn it off on poor unsuspecting Andy? Would he even know? But what if he went to Starbucks for a coffee and handed over the same fake five? He would know it came from me, and I, too, would be tainted in his eyes as McDonald’s is in mine. No. Instead, I brought it home and taped it to my computer as a reminder of my personal war with my one-time biggest ally. Don’t you see the higher purpose of that fake five dollar bill? It was a gentle reminder from above that real food shouldn’t be served in a greasy bag by a clown with flaming Dacron hair wearing a crimson-accented, school-bus-yellow, zip-up leisure suit. Not to mention tossing it at you through a drive up window while you’re fighting traffic. Not that you were driving, or even walking well for that matter, but sitting next to howler monkeys isn’t a healthy way to dine either. Geez, do we have to hit you over the head with a “Super Size Me” video? Ask Morgan Spurlock about the gut-wrenching evils of fast food. So, that 6 oz bag of fries carries with it a whopping 570 calories. Do you really want that super-sized? You’re a food writer, you should be eating real food. Okay, I don’t even know you and I’m acting like I’m your mother. Sorry about that. Really, I am. Especially when you were so nice to mention me in your blog. Look at it this way, that play money prompted you to boycott McDonald’s. How cool is that? And I don’t want to scare you or anything, but just think what might happen if you wander into KFC and try to order a Variety Big Box Meal, which by the way, includes a drumstick, a crispy strip, a box of popcorn chicken, two homestyle sides, a biscuit, and a refreshing 32 ounce drink? And that’s an “individual” meal! Don’t even think about it, David. And you thought that counterfeit ordeal was unpleasant. You just wait. Well, anyway, this experience of yours was a divine intervention. Hey, you’re the guy using words like “kitchen” and “existential” together. Pay attention. Someone upstairs is nudging you away from that stuff. I’m just the annoying back-up singer. Dooo-wop, dooo-wop. Thanks again, David. I love you! P.S. I won’t bug you anymore, I promise. Wow… I’m amazed that someone actually has counterfeited $5 bills. I would go back to McDonald’s and just buy something with that fake $5 and tell them that if they gave it out, they should certainly accept it back. We’ve actually been pretty good about staying away from fast food these days. It’s not a conscious decision—it’s just more convenient to pack snacks from home. That, and I usually don’t even have a $1 to spend on the dollar menus! Dave I am ashamed you ate at McDonalds! I raised four boys, and after I watched what they went through every time we hit McD’s (the opera house), I swore off all those places a long time ago. We boycotted Mickey D’s years ago, and not because of a fraudulent $5, but because we could get better food at a sit down restaurant for the same price sans the calories. Kudos!